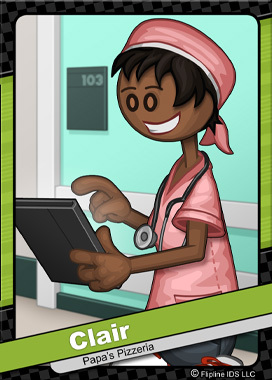 Clair is a Physician at the Frostfield Clinic Emergency Department. She works long, twelve-hour shifts that change each week. For Clair, the fulfillment she receives from helping people will always outweigh her somewhat insufficient sleep schedule. Whenever Sarge or Radley attack, Clair is always there to look after Papa Louie’s rattled customers. Although Clair's schedule can be hectic, she always finds time for her daughter, Sasha.